In terms of events this year, the road to Aarhus is half way over for the Finn fleet. The fleet has had an exceptionally competitive start to the year with a range of winners and a range of conditions. Is it too early to start predicting form for the first Tokyo qualifier that begins in less than three months time? Perhaps not. The returning Rio 2016 gold medalist, Giles Scott, has proven that he is still a force to be reckoned with. He trained for about 60 days ahead of the World Cup Series event in Miami, and took that comfortably with a day to spare. Situation normal. Miami also marked the return of Caleb Paine the bronze medalist from Rio, who also proved to everyone he had not grown stale after 16 months out of the boat and took the silver after overcoming the ever-improving Alican Kaynar in the medal race. The fleet soon re-assembled in Cádiz, Spain, without Scott, or a very early, and often windy, Europeans. After just 18 months in the boat, Nicholas Heiner showed that his winter training down under with the Kiwis was very worthwhile, as he eked out a useful points lead in the opening series in a huge range of conditions, light, windy, moderate with some satisfyingly huge waves. He had the speed, the tactics and everyone thought was heading for a first major win. But sport is not often like that and the medal race exposed gaps in his repertoire that gave the title to the 40-year-old Ed Wright, who had last won the title 12 years previously. Heiner capsized twice in the extreme medal race, and finished last in conditions that are very rarely sailed in. It was borderline survival, but the sailors loved it and the videos produced here went about as viral and anything ever produced by the Finn class. Scott returned for the Trofeo Princesa Sofia in Palma and it was again situation normal. Though he didn't manage to win a single race, he had the gold medal sown up before the medal race. Heiner recovered from a shaky start to be the only one to really pose a threat, while Andy Maloney came back from an even worse start to the regatta to take the bronze. Then the 40 Finns at the World Cup Series event in Hyères had a week of light winds with a number of different sailors seeing the front. 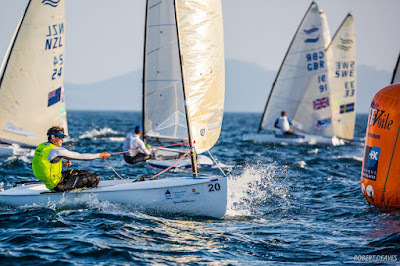 Scott pulled out at the last minute, allegedly because of BAR commitments, which allowed Wright a late place, but he performed very poorly in the light conditions, as did several others who had made headlines in the previous regattas. It was the lightest regatta than many sailors could remember, with the wind only over 10 knots on one day of the opening series. Again Heiner looked like the winner, the only sailor to win more than one race in the opening series – he won four of them just to prove the point – but again fell foul of the medal race to take a third silver in a row. Jorge Zarif took gold by winning the medal race with Kaynar taking his second bronze of the year. For many sailors, now is the time to have a mid-season break, even though it is only May. Many have been full time since late 2017 and need to recharge ahead of the final push to Aarhus. There are not many events left before the showdown in Denmark. The World Cup Final in Marseille – the sailing venue for the 2024 Olympics – will have a limited entry of just 20, while the Medemblik Regatta has only attracted a small entry so far. However for sheer Finn entertainment and fun, all eyes will be on El Balís, near Barcelona, in Spain in two weeks time for the Finn World Masters. Falling just short of a record-breaking turnout, 350 Finns from 32 countries have entered for what will be one of the largest dinghy events of the year. It has attracted many new and returning sailors, including Olympic gold medalists and world champions. More on that later. For those training hard for Aarhus, there are precious few big regattas left to race. The one big event left should be Kiel week, which should provide similar conditions to Aarhus, and is expected to attract a large entry. It is just five weeks before the world championship begins in Aarhus. Scott is provisionally lined up for the Marseille World Cup Final, so we may get a better indication there of his form against the rest of the fleet, but he will undoubtedly go into the Aarhus event as the favourite, having not been beaten since Palma in 2016. But of the rest, who are the challengers? Of the other Brits, Wright is European champion, while Ben Cornish shows signs of brilliance, but both failed to perform in Palma and Hyeres. Alican Kaynar has two bronzes this year and is rapidly becoming one of the medal race regulars. He said in 2016 that Rio was just training for Tokyo, and you get the impression that he is more focused than ever. Jorge Zarif's win in Hyères was his first major win in Europe since 2013, when he became the only sailor to win the junior and senior world titles in the same year. He has been maturing nicely as an all-round sailor and it will be fascinating to watch what he does next. Zarif is one of only two sailors who have made the medal race at all four major events this year. The other is the current world champion, Max Salminen. He spent the winter training in Australia and thinks that sharpened him up ready for the early starting European season. It paid off at the Europeans, where he took the bronze medal. The tight Kiwi training group, and America’s Cup winners, Josh Junior and Andy Maloney, have spent some time at the front of the fleet this year, but lack consistency. Junior placed fourth at the Europeans, but then struggled to get back to the front in Palma and Hyères. In contrast, Maloney took a medal in Palma and made the medal race in Hyères. Jonathan Lobert, the 2016 European Champion also looks dangerous much of the time but has not really been consistent enough to take a medal. However, he has made all three European medal races and that is where everyone wants to be come Aarhus in August. Many sailors still have a lot of work do do over the next three months if they are to mount a worthwhile challenge for one of the eight Tokyo places in Aarhus, and those who have found the front so far know very well they are not safe. Complacency is brutally punished in the Finn class. One thing is clear though. With 100 Finns from 44 nations in Aarhus, it’s going to be the toughest competition of the year. We can’t wait.